Chicago | Reuters — Chicago Mercantile Exchange hog futures ended lower on Thursday after packers paid less money for market-ready, or cash, hogs as prices for pork at wholesale eased, said traders. Packer interest in raising hog bids waned in the midst of plentiful supplies and while Smithfield Foods closed some of their plants to upgrade equipment, said traders and analysts. 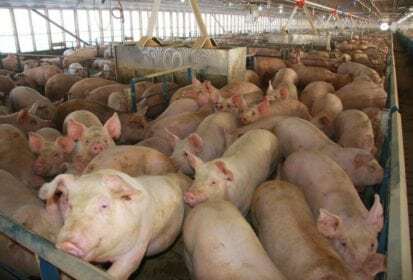 Thursday’s U.S. hog slaughter totaled 367,000 head, 80,000 fewer than a week earlier, according to U.S. Department of Agriculture data. Wholesale pork values primarily drew pressure from lower prices for pork bellies and picnic shoulder cuts — some of which are used to make pulled pork. Fund liquidation hastened market declines after some trading months fell below key technical support levels. August hogs ended down 1.5 cents/lb. at 64.9 cents (all figures US$). October closed 1.675 cents lower at 52.25 cents, and below the 10-day moving average of 52.842 cents. Technical selling and profit-taking undercut CME live cattle contracts, which threaten how much feedlots receive for their market-ready, or cash, cattle by late Friday, said traders. Despite futures’ losses, the cash price outlook appeared strong, said a feedlot manager. He cited firmer wholesale beef prices, triple-digit packer margins and processor interest in buying livestock. However, Jim Clarkson, a broker with A+A Trading Inc., said: “I think that the packers are in control of this market and they’re not going to pay up.” He pointed to ample captive supplies, or cattle already under contract with packers. Packer bids for cash cattle in the U.S. Plains ranged from $108-$110/cwt against feedlots asking $115-$116 for their animals. The bulk of cattle last week brought $113. August live cattle closed 1.075 cent/lb. lower at 107.95 cents. October ended 1.4 cents lower at 109.375 cents. Both contracts settled below their respective 200-day moving average of 108.923 cents and 110.91 cents. Live cattle futures’ retreat and technical selling pulled down CME feeder cattle contracts. August closed 1.4 cents/lb. lower at 151.425 cents.